The 80’s were a golden age of Sci-Fi cartoons. We had Transformers, Voltron, and of course, Thundercats. The story of feline humanoids on third earth has stuck with a few hackers, including [Juan Garcia]. Juan has tunneled his fandom into something amazing – he’s built his own version of Lion-O’s iconic Sword of omens. The modeling and 3D print work are top-notch. While this sword doesn’t have the Eye of Thundera as a power source, it does have some pretty clever electronics. It’s also one of the amazing entries in this year’s Sci-Fi Contest. [Juan] wanted to create the “sight beyond sight” effect from the TV show. He started with an MPU6050 six axis gyro + accelerometer. These chips are most often found at the heart of quadcopter controllers. An Arduino Pro Mini reads the sensor data. When the sword is lifted vertically, it turns on a row of WS2812 LEDs. The LEDs replicate the pulsing eye effect from the cartoon version of the sword. [Juan] really made this a neat build. The whole sword is powered by an 18650 Li-Ion battery. Power control and charging circuitry are all concealed inside the 3D print. When it’s time to charge up the eye, the hilt can be unscrewed to reveal a USB charging port. Click past the break to see this hack in action! Click past the break to see this hack in action, and don’t forget – there’s still time to enter the Sci-Fi Contest! A bubbling Wurlitzer juke would be a prized addition to the classic picture of a man cave — brass-railed bar, kegerator, pool table, tin signs and neon on the walls. But it would take a particularly geeky abode to give a proper home to this Millenium Falcon holochess table jukebox. And a particularly awesome one at that. It all started with a very detailed and realistic replica of a holochess table made by [Jim Shima]’s friend. A lot of time and care went into the prop, and [Jim] was determined not to alter the look while installing the media player gear, consisting of a Raspberry Pi running OSMC and a 160-watt power amp. The speakers were problematic – there was nowhere convenient to mount them except under the brushed aluminum playing surface of the table. The sound quality was less than acceptable, so rather than poke unsightly holes in the table, [Jim] devised a servo to lift the table while the music is playing. An LCD monitor and wireless keyboard slightly detract from the overall look; we’ll give [Jim] a pass until he can come up with a holographic display to finish the build right. But we are disappointed that he didn’t use “Mad About Me” by Figrin D’an and the Modal Nodes as the demo tune in the video below. It’s a nice build, and you’ll want to check out [Jim]’s Hyperdyne Labs for more drool-worthy props and effects. 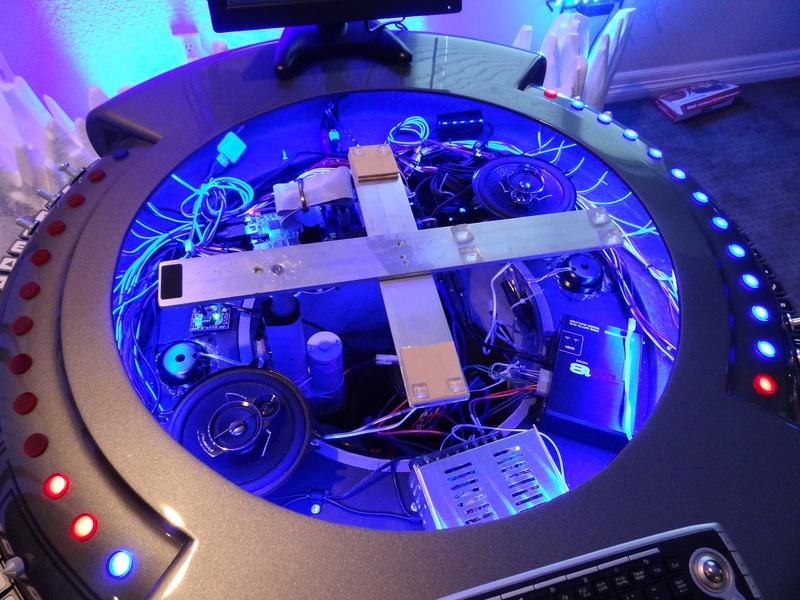 And for another fandom jukebox, look over this jukebox that’s bigger on the inside.